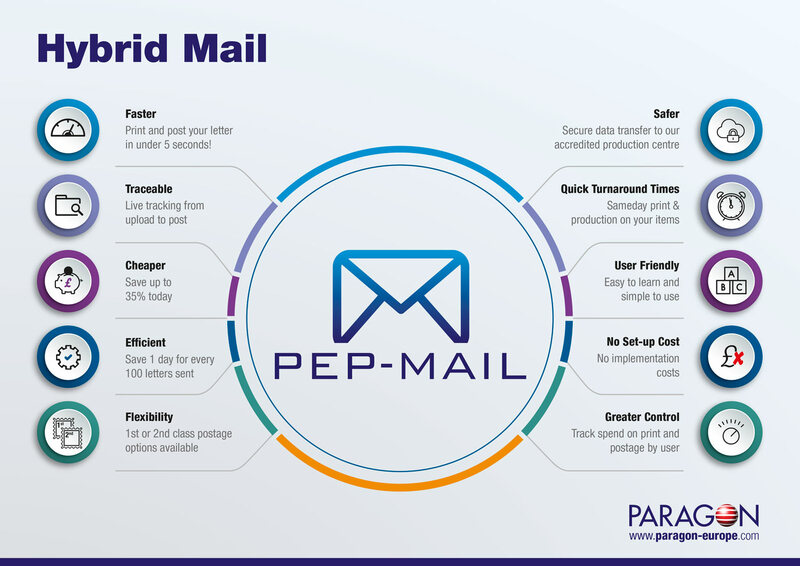 Hybrid Mail is mail that can be delivered using a mix of electronic and physical delivery - documents are delivered electronically to a central location and then printed and mailed in large batches. Savings are delivered through a huge reduction in manual handling as well as economies of scale for printing and discounts on mailing . If you are spending a lot of time and money printing, folding, enveloping and franking letters, hybrid mail may be the solution for you. In modern organisations very few people have the luxury of having a secretary or assistant to handle tasks like printing and mailing. The dedicated team at Paragon will manage the process of printing, folding and franking letters, so you don't have people spending valuable time standing by a printer, trying to find an envelope, and looking for stamps. Not only does hybrid mail provide excellent value for money, it also keeps your team focused on their core responsibilities. It really is post at the click of a button. Mail is sorted and consolidated to achieve postal discounts. From direct mail to Snapchat - how do you communicate with your customers?